Spinning for Charity – oh what a feeling! Last night I dragged my spinning wheel on the bus in a large roller-duffle bag along with a bunch of wool fibre, handspun yarns, and other goodies to sell, as well as a basket in my other hand. Why in the name of all that is holy would I attempt such a thing on a Sunday evening on an overcrowded city bus on a humid night in Vancouver? For a charity show, that’s why! As mentioned in my previous blog post, I’ve been dealing with a lot of chronic pain stuff (and all that it entails) lately and I wasn’t able to make new items to sell at this charity event for the PACE Society. 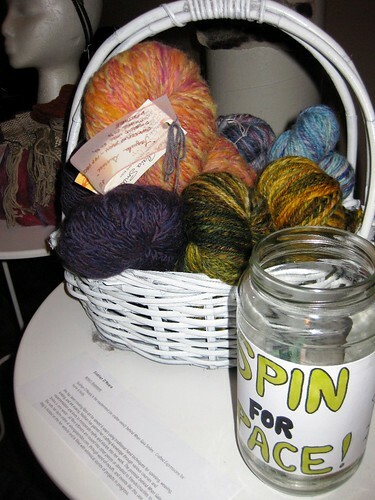 So I brainstormed and came up with the idea to spin yarn for PACE at $1 for every 2 minutes spun. The results? $28+ was put in my jar, which equates to 56 minutes spun (almost an hour!) I’m pretty sure I spun longer than that though, as many people were curious about what exactly I was doing. Part of the reason why I thought the spinning wheel would make a good piece to the art show was because of the fact that it’s interactive. People asked questions: how does spinning work? Is this what Ghandi used? (the answer to that is no, he used a charka) Why does your spinning wheel look so different than in the fairytales? (it’s a modern Lendrum, that’s why, etc). 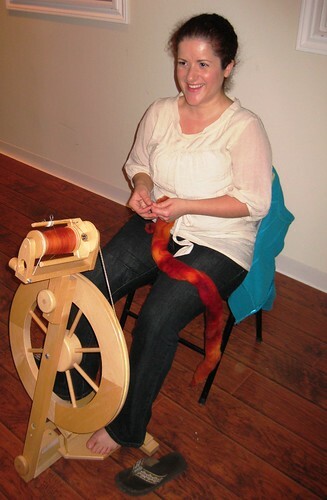 Honestly, I love teaching people about spinning (and crafts in general) – it’s a part of our collective cultural heritage. Where would be we without spinning? Still wearing loincloths, that’s where! I also love that I was able to bring in donations via live demonstration. At one point, my friend Jessie told another friend “I can hear Siobhan making money out there” as coins were dropped into my “Spin for PACE” jar. And while $28 doesn’t seem like an awful lot of donations, every dollar going to this charity helps. Thank you to everyone who came out, who donated, and was curious! Listening to questions from donors about spinning. 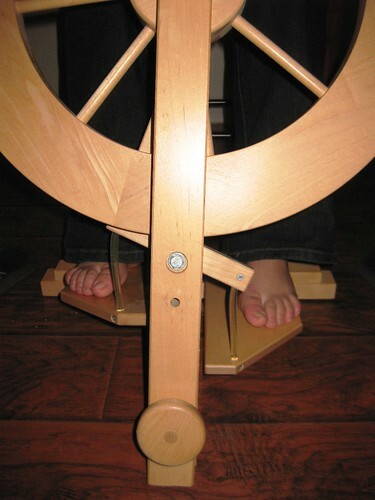 Many folks commented on the fact that I was spinning barefoot – its the best way to spin as I can feel the motion of the wheel better. More photos available on my Flickr page. 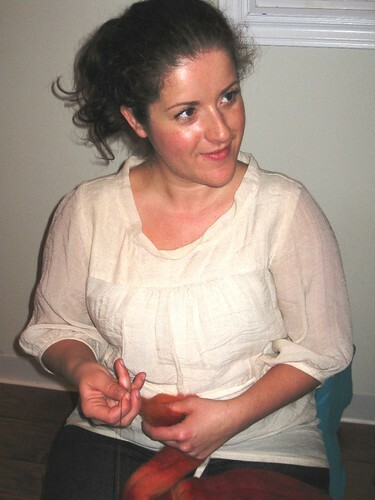 Thanks to Carolyn for taking the pics! You are currently reading Spinning for Charity – oh what a feeling! at When Gaia Smiles.